The Great Summer Army arrived in Northumbria in 870. Promptly there was trouble. One of the raiding earls decided to have a bit of fun. But he ran into one of the local earls at the river Oxno. The east wing of the Northumbrian army held the bank of the river which had a short stretch east of a plank bridge that was fordable. To the west half of the raiders, who had come all the way from Kiev for a Brittanic holiday, had managed to work across the stream and faced off against a force of mercenaries from the Saxon plains. The Rus immediately sent a force along the river to try to help secure the bridge. A valiant group of Saxons, led by Njal, raced to intercept. The plains of Kiev are more vast than the plains of Saxony and, on this day, Njal found himself the last man standing, his entire retinue killed. With one last invitation to the Valkyries he charged to his death against a dozen Rus. Meanwhile the Norse leader sent his large command in two assaults - one across the bridge and one over the shallows. The Northumbrians, outnumbered, fought desperately but vainly as the northern steel cut deeper this day than that forged in more southerly climes. The Rus, too, on the further west flank, triumphed in a wildly swirling melee, their massive two-handed axes splitting many a shield. In the end the Earl of Northumbria fell with his men at the foot of the bridge and the Saxons bought their passage back to the mainland, what few remained, with the gold they had been paid by their vanquished employer. There was much feasting by the few Rus and Norse survivors on the rich cattle and sheep of the earl's lush holdings. ​Game played using 25mm figures and home rules by Chris Anderson. A group of Wyandot chiefs asked to parley with the British garrison of Fort Sandusky. However, Private Smallwood had run all the way from Detroit to warn the garrison, led by Lieutenant Luckey, of this very stratagem that the same Indians had attempted at Detroit. Forewarned, Luckey spurned the chiefs who then retreated to the woods which encroached to about 80 yards from the blockhouse that served as the “fort”. Luckey, with only 13 men, declined to garrison the supply shed which, due to the time of year, was almost empty. ​The Wyandots began to lob flaming arrows at the blockhouse and the garrison fired back at the well-hidden natives. Chief Tall Deer did dispatch two braves to take possession of the supply shed. Their dash from the woods to the shed and then a shimmy through the window was met by a fusillade from the blockhouse. Both warriors arrived unscratched though the war feather worn by Slinking Dog was clipped by a ball just an inch or so from the warrior’s head. A half hour later two more braves, weeing this as the only way to count any coup, repeated the action. However, this time, Abel Straight, resting his musket on a firing port from the second floor, got a good bead and his bullet cut a sharp groove in the hindquarters of the second brave as he dove through the storehouse window. Eventually a fire arrow caught in the roof of the blockhouse creating a small, stubborn fire which gradually, but very slowly, consumed the roof. Once the fort was afire the Wyandot withdrew deeper into the woods, out of sight and Luckey’s men ceased their desultory fire. Two natives had been slightly wounded. The spirits of the garrison were raised when they heard gunfire erupt to their north along the narrow path from the lake. Major A. D. Vance was leading a relief column from Fort Erie, seven companies. Vance had disembarked from his canoes and immediately deployed his command in two lines, the trail from the landing to the fort neatly bisecting them and allowing a place for the good major to ride his horse in comfort in the middle of his command. On the right or west side of the trail two companies of Highlanders deployed in front and two companies of the 44th Line formed behind. To the east side the ranging company of Captain Forrest and the militia from Erie of Captain Moss made up the front line with the “city” militia from Albany of Captain Downs alone in the back line. Two warbands of Shawnee and another two of Delaware with a small band of Mingo waited in ambush for the relief, having watched it make its way along the river and setting up patiently in a most opportune place between the landing and the fort where there would be maximum opportunity for coup and minimum chance of loss. Chief Howling Wolf sprang the ambush on the relief column when it was still a mile or so from the fort. Mostly from surprise the Highlanders were stung by the sudden scattered fusillade and fell back in some disorder behind the advancing line companies. Lieutenant Cohannon in the center now came face to face with Keoqua’s band of Delaware’s. Faced with the much more resolute redcoat line of bayonets, Keoqua fell back to leave the Mingo band of Chief Red Jacket in contact. Cohannon took a ball in his left hand as Red Jacket’s band opened fire from their ambush positions. Enraged, Cohannon ordered his men to charge. Up a small rise and through the light underbrush the redcoats met the Mingo, surprised by the audacity of the whites. The cold steel of the bayonet, projected from the distance of a musket barrel, proved significantly better than a hand-held war club. The Mingos were decimated with 20 killed and another 20 racing pell-mell in disgrace for the loss of only 4 redcoats wounded. But now Cohannon had outstripped the rest of Vance’s command. He would stay on his small rise for the next hour taking the shots of Keoqua, who had reformed, and various other small parties of natives, being gradually reduced until finally forced to withdraw to the landing spot as the rest of the British command dissolved. Moss led the left wing forward and quickly ran afoul of Stalking Lynx’s band of Shawnee. One of the first shots killed Captain Moss but the company, wise to the ways of woodcraft, knew their best hope was to stay together. While the Albany militia cowered behind them the valiant farmers and trappers from the Erie region held their ground, only falling back when they perceived a threat to their open left flank. The ranging company cautiously filled the gap between Moss and Cohannon engaging elements of Stalking Lynx’s, Keoqua’s, and Wolf Claw’s bands. They maintained their cohesion which allowed Cohannon and Moss to eventually withdraw without too much loss. However, they failed to exploit Cohannon’s destruction of the Mingo and failed to materially support the militia who, for most of the battle, had a slight numerical advantage. On the far right Howling Wolf’s warriors displayed by far the best marksmanship of the day and the British regulars of Captain McManus displayed the greatest stoic bravery. McManus’ 40 man company suffered over 50% losses, including the valiant captain, struck in the shoulder and ear as he steadied the line. With the loss of their leader the redcoats fell back through Sergeant James Wallace’s company of Highlanders. Wallace was more fortunate than the captain – the bullet that found him buried itself in his pocket testament, sparing his breast. In the end, Howling Wolf’s band collected 21 scalps and another 39 men in McManus’ and Wallace’s companies were nursing wounds by the time they had made it back to the landing site. Vance, seeing his right shattered and unable to get further than Cohannon’s small rise, ordered a general withdrawal. Fortunately for Lieutenant Luckey, Vance abandoned two barrels of rum at the landing site and the natives spent that night celebrating their victory and counting coup, deciding the next morning that it was too difficult to attack the fort and returned to their villages. October 3, 1862 broke gray as the noncoms kicked and prodded the soldiers of Rosecrans’ Army of the Mississippi. Orders had come to move out of their entrenchments near the railroad junction of Corinth, Mississippi and meet the invading Confederate Army of West Tennessee under General Earl Van Dorn. A hasty breakfast of hardtack and cold bacon – the lucky ones got the dregs of coffee from the sentries – and off they marched, north into the wet, open woods, and scattered hardscrabble farms toward Dawson Creek and the old Confederate works. The Confederates had been in motion since early morning, skirmishing with Union cavalry pickets and marching south along the Chewalla Road. Just north of Dawson Creek they deployed, Mansfield Lovell on the far western flank with Dabney Maury next, then Martin Green’s division. Union deployment was a bit offset from the Confederates with Thomas McKean’s division on their far western flank but overlapped by Lovell further to the west, then Thomas Davies’ division, and finally, the cavalry division of John K. Mizner, beyond Green’s flank to the east. Unfortunately for both sides, neither took advantage of their flanking position. Mizner was paralyzed by the idea that John K. Jackson’s rebel cavalry brigade could be even further east and Mansfield Lovell, inexplicably, failed to urge his men on with any sort of vigor. McKean reached the creek first and immediately dressed his lines and steadied his mostly veteran command into place. John McArthur’s brigade held the left, in the air as it were. In McKean’s center was John Oliver’s brigade and the right and reserve were the veteran Iowans of Marcellus Crocker. The line was ably supported by three batteries of Napoleons, 16 cannon in all. Davies was still 600 yards from the creek when the ball opened, with Silas Baldwin’s brigade on his left, Richard Oglesby on the left, and Pleasant Hackleman’s brigade in support. Davies also had three batteries, all rifles, 12 guns in all. On the Confederate right (west) Dabney Maury’s division of veterans came crashing through the woods with Charles Phifer’s brigade of dismounted Texas cavalry on the far right, expecting Lovell to cover their flank, and William Cabell’s Arkansas brigade on the left. John Moore’s brigade was in support. Rapley’s Battery of rifles and McNally’s Battery of Napoleons supported the assault. The Confederate left, Martin Green’s division, was under the watchful eye of Sterling Price, “Old Pap”, with Earl Van Dorn, the overall commander, observing from Price’s side. Green advanced with Elijah Gates’ brigade of Missouri veterans on the right, Bruce Colbert’s brigade in the center and the Mississippi brigade of John D. Martin on the far left (west). Martin’s brigade had ignominiously run at the recent battle of Iuka and were held in low regard by the army. Deployed in support was William Moore’s brigade. Dawson’s Battery and Wade’s Battery, both of Napoleons, supported the main attack. Maury developed his attack with precision and deliberation, bringing steady, intense pressure to bear on the bluecoats. Stirman’s Battalion of sharpshooters took first blood then the 3rd Arkansas (dismounted) charged over the creek, the 21st Missouri suffering 40% losses to the withering assault. A bit further along the line, the 18th Wisconsin was forced back after a similar 40% loss, surrendering their bloodied ground to the 21st Arkansas. But it was not all glory for Maury, as the 6th Texas (dismounted) suffered mightily from repeated blasts of double canister from the Napoleons of Battery F, Illinois Light Artillery and Rapley’s Battery was forced to withdraw one section due to losses to the crews from the heavy fire of the 18th Missouri (Union). In all Maury suffered 443 killed, wounded and missing, McKean roughly twice that. Green and Davies raced each other to the creek and, especially to the small farm of Cyrus Burton. Burton’s small 10-acre spread was surrounded by a stout stone wall and it was this small open space and its surrounding wall and rough-hewn buildings where the hardest fighting of the day was to occur. Gates threw the 16th Arkansas at the farm and Colbert supported the attack with the 14th Arkansas and Dawson’s Battery. Baldwin countered with the 14th Missouri (Birge’s Sharpshooters) and the 57th Illinois. The bluecoats got to the farm first but the extra weight of the cannons, in the end, won the day. 225 Confederates and 190 Federals fell in the small farm. In the center, just west of the farm, at the only bridge over the creek (though it was low enough to walk over at all points) both armies threw their reserves. Crocker’s veteran Iowa troops blocked the road for the Yankees while elements of Gates’ and Cabell’s brigades attacked. Behind the front piles up the Confederate brigade of William Moore and the Union brigade of Pleasant Hackleman. No decision was made here. The Union was forced to withdraw based on Maury’s attack and the events on the far eastern flank. There, Martin’s disgraced Mississippians and the 37th Alabama angled into the air where Mizner was supposed to be. Hackleman tried to slow the rebels by deploying Battery D, Missouri Light Artillery but the Alabamians and the 38th Mississippi advanced relentlessly, capturing two guns. In desperation, and in contradiction of his orders to support Baldwin, Hackleman redeployed the 2nd and 7th Iowa, but by the time they arrived it was too late, and Martin threatened to cut the Federal route back to Corinth. Rosecrans ordered a general withdrawal to the inner works which was done in good order, as losses in Davies division, except at the Burton Farm, had been relatively light. Van Dorn clapped Price on the back as the Federals pulled back and congratulated him on a “brilliant victory” and ordered the troops stop for dinner. The next day, Van Dorn hurled the same troops at Rosecrans’ works with another two Federal divisions joining their comrades. Again Lovell would fail to attack aggressively and the Confederates would be forced to ignominiously retreat back across the Mississippi, never to again cross east. We use Mr. Lincoln's War and 15mm figures. Premise: Frederick turns to save his capitol from the invading Russians. Unfortunately for the Russians diarrhea has “run” through the ranks of the senior officers leaving a Cossack, Hetman Platov, as the senior officer. Frederick meets the Russians somewhat dispersed and is able to offer battle with even numbers. This, for the less well-drilled Russians, spells ruin. Both armies deployed in a long double line of sixteen battalions each on either side of three small hills. The terrain was otherwise unremarkable, being used by the locals as pasturage and wheat fields. The armies deployed symmetrically with each placing a 6-pounder battery between the southernmost and central hill and a 12-pounder battery between the center and northernmost hill. As they maneuvered to contact the Russian 12 and the Prussian 6 deployed early. At a range of about 600 yards the 12-pounder began bowling the Prussian Grenadier Battalions of Unruh and Burgdorff. Prussian gunnery was initially as good with the 6-pounder causing casualties and disorder in the Narva Regiment at the same range. For the rest of the afternoon the two batteries would fire at these two targets with distinctly different results. While the grenadiers would suffer over 360 casualties to the long-range fire they never wavered and were ever-present as a reserve if needed from the musketry battles raging to their left and right. Narva, on the other hand, would never recover, suffering only 10% losses (57 men) but deteriorating in their order as the bombardment continued, eventually running from the field in disgrace without ever nearing an enemy unit. On the southern end of the field Regiment Markgraf Karl faced off against Rostov and Regiment von Bevern faced Astrakhan across a broad, gentle slope covered in young wheat. Here the normal stoicism of the Russian foot soldier was in full evidence against the superior firepower of the Prussian musketeers. In over an hour of musketry exchange, over 400 Russians fell to color the wheat red, only at the very end did the 1st Battalion of Rostov finally fall back from the fury. The Prussians suffered only 111 casualties. In the center Platov sent Musketeer Regiment Apcheron and his brigade of converged grenadiers against the Fusilier Brigade von Wied and Olde Six. Wied found itself outgunned and finally 2nd battalion was forced to fall back to reform. This allowed Apcheron to pivot on Olde Six which was still standing having outdueled two battalions of Russian grenadiers. In the end Apcheron was forced to withdraw as all of their supports abandoned them and the Oesterreich Grenadiers marched forward under Frederick’s careful eye. Olde Six suffered over 350 casualties while inflicting 446 on three different Russian grenadier battalions and forcing them all to fall back before the blind discipline of Freddy’s Guard Grenadiers. It was on the northern flank, across a small hill that had, until that morning, been a resting place for cattle in the summer sun, where the battle was decided. Here the two battalions of the Regiment von Itzenplitz utterly destroyed a brigade composed of two battalions of Russian Guards and two battalions of the St. Petersburg Musketeer Regiment. 1st Itzenplitz engaged the Guards while 2nd engaged St. Petersburg, each supported by a 3-pounder battery. In a gradual wearing away, the 2nd Guards, then 2nd St. Petersburg, then 1st Guards all withered away while the Prussians fired and stepped forward, fired and stepped forward, inexorably pushing even as their ranks were thinned. The Russian gunners died at their pieces and, finally, only 1st St. Petersburg was left to withdraw in order before the remnants of Itzenplitz. The brave men of Regiment von Meyrinck were never called from their supporting line. In all, the Russians suffered over 800 casualties while Itzenplitz lost 475 but held the bloodied rise and watched the crumpled Russians tuck pride and tail between their legs and skulk back to Warsaw. 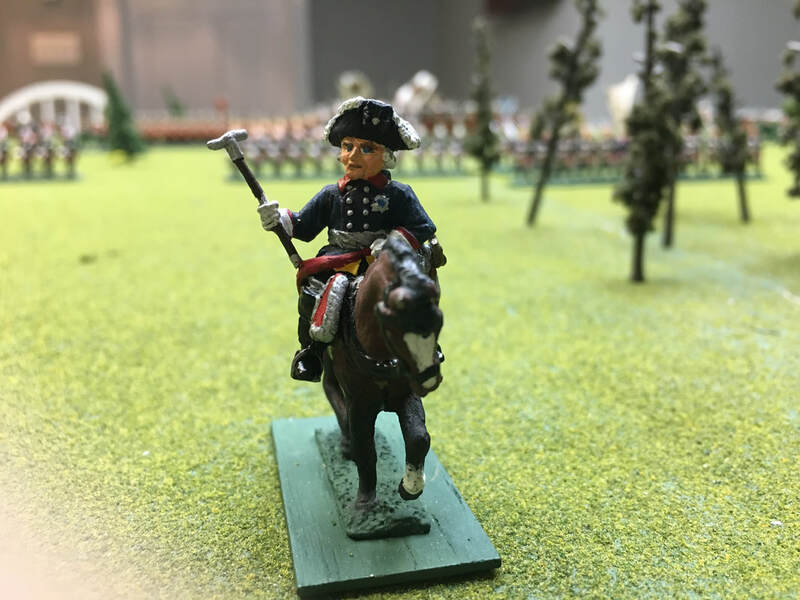 ​We use Volley Fire rules and 25mm figures for our Lace Wars games. ​We played a representation of the Battle of Empress Augusta Bay, of November 1-2, 1943. While the actual battle was a mass of confusion with ships of both sides colliding with each other in the dark and shooting at friends, ours was a much more controlled scenario exploring “what if” the American plan was carried out to perfection. The Japanese under Admiral Unlucky Tomiachi approached as they had historically with the two heavy cruisers Myoko and Haguro in line ahead flanked by two columns each of a light cruiser leading and three destroyers. The Americans under Admiral Just-Follow-the-Plan Caccamerrill and Close AtSpeed Burkox started in line ahead across the Japanese “T” with four destroyers then four “light” cruisers and four trailing destroyers. The Japanese also had two scout planes intended to drop flares. The battle began with some tentative radar contacts and a flash of anti-aircraft fire as gunners on the Cleveland and Claxton opened up on the two scouts. The AA gunners were met by spectacular success as both Suisei exploded in mid-air, foreshadowing the rest of the game. Admiral Tomiachi, acting on imperfect information, split three destroyers to his right (west) and turned the rest of the squadron hard left, intending to match the American gun line with his own four cruisers, screened by the three eastern-most destroyers. Admirals Caccamerrill and Burkox executed the historical plan with the lead four destroyers continuing forward and the rest of the command reversing course. The entire Japanese squadron opened fire on Cleveland, scoring hits and starting fires but not knocking her out. The Americans opened fire with the few ships who had made radar contact, with a couple minor hits. Both squadrons now established on their new courses, and with plenty of gun flashes to fire at, the battle was joined in earnest. The Japanese launched torpedoes from every ship but were quickly smothered by the American shells. Myoko was first to be crippled, then Sendai and, one by one, the destroyers. The return fire was less effective, causing minor damage to Denver, Ausburne, and Foote. Tomiachi ordered a withdrawal only 5 minutes after launching torpedoes and ordered all ships to make smoke. But it was too late. The Americans had full acquisition by radar and, at ranges from 5000-9000 yards, simply smothered the Japanese fleet. Deftly turning into the torpedo salvoes only Ausburne was hit out of the nearly 70 Long Lances launched, and that hit proved to be a dud. Every Imperial ship was sunk with only Cleveland and Foote being damaged enough to be forced to leave the landing area the next day. With no confusion, unerring radar, and perfect execution, the Americans in the game won an overwhelming victory denied the actual Americans 75 years before. No matter, historically the Japanese had been bloodied sufficiently that they never again made a significant sortie in the Solomons. Game was played using 1:2400 ships and Sbase3 computer-assisted rules. Fremont swung his legs into his boots at the side of his cot and barked orders to his waiting staff, their dress uniforms about to be badly soiled in the day’s events. Within minutes they stumbled over each other and raced out of the command tent putting Fremont’s small Federal command into motion. Further south, Brigadier General Custer calmly surveyed an alarming situation. His three tiny cavalry regiments were galloping into delaying positions as General Stonewall Jackson’s Army of the Valley deployed astride the Valley Pike. To Custer’s rear Brigadier General Dan Ricketts received an urgent message from his signal tower. The grizzled captain gruffly informed him that the drill was over. Jackson had arrived and Custer was engaged. Ricketts issued orders to his three batteries of U. S. Artillery to bring up the caissons and re-supply. Jackson sent Colonel John Wilkes’ brigade to the left to develop Stempel’s Woods where the 7th Michigan waited. Brigadier General Dan Adams deployed to the right into the Douglas hayfield where the 5th and 6th Michigan cavalry awaited. Armistead’s brigade followed Wilkes and Palmer supported Adams. Desperately the cavalrymen popped away with their Burnside carbines from behind Douglas’ stout snake fence and in Stempel’s tangled wood lot. Adams’ struggled to close the range sufficiently for the smoothbores arming the 17th Tennessee and the 8th Louisiana. Wilkes’ men struggled with the dense undergrowth, the creeping vines delaying them almost as much as the Wolverines. Pouring down the Valley Pike in the opposite direction was Brigadier Thomas Milroy’ New York Brigade and Brigadier General Franz Sigel’s German Brigade at the head of Fremont’s small army. Unimpeded by the few ineffectual balls fired by the ancient 6-pounders of Bay’s Virginia Battery they surged forward into the north end of Stempel’s Wood. Milroy’s 21st and 30th New York found less undergrowth in the north half of the woods and managed to surprise Armistead’s 13th Louisiana as it started to deploy from column. Soon the doughty New Yorkers were locked in a death match at close range in the thick forest with the Pelicans and Tarheels from the 4th and 7th North Carolina. Meanwhile the 3rd Florida finally dislodged the 7th Michigan. Sigel, in the forefront of the battle, gave confidence to his green troops, steadying the 23rd New York who marched into the gap left by the exhausted cavalrymen. Deep in the woods the equally green 95th New York led by Colonel Marsena Patrick met and halted the flanking maneuver of Armistead’s 4th Kentucky. Fremont, finding the bullets flying a bit thick found it necessary to personally guide the 80th New York into a reserve position at Miller’s Farm behind the heavily pressed 5th and 6th Michigan. By the time Adams finally dislodged the cavalrymen, Sigel had stabilized the Union right and the 24th New York, personally guided by Ricketts, had joined the 80th. Ricketts’ gunners meanwhile, took a dreadful toll on Palmer’s brigade as it tried to march across the mile-long swale of young wheat and oats from Douglas’ fields to Ricketts position on Tower Ridge. By the time the Virginians of Palmer’s brigade reached the gunners they had suffered almost 300 casualties and, more importantly, Francis Stone’s brigade of Union infantry had arrived and been skillfully deployed by Stone to support the batteries. As the sun passed toward the west Adams and Palmer made one last gasp of an attack on Miller’s Farm and Tower Ridge. After almost 6 hours under fire though Jackson’s veterans had nothing left and they recoiled back to the safety of Douglas’ fences. In the woods both Sigel and Wilkes had been hit but remained in command. Jackson, surveying the strength of the Miller Farm position in the center and a second line waiting patiently behind Sigel and Milroy reluctantly issued the orders to break off the engagement in the woods as well. In light of the stunning victory, Lincoln appointed Fremont to replace Major General George B. McClellan outside of Richmond. Fremont subsequently was unable to extricate Franklin’s V Corps when Joseph Johnston counterattacked and suffered a devastating defeat to end the Peninsular Campaign begun by McClellan. ​Game was played with 15mm figures using Mr. Lincoln's War rules. Magnor Bloodax had led his Danish band to capture the fine castle of Helgor in the late spring. However, Sven the Swede and Hedin the Isleman decided the castle would be a great place for them to spend the coming winter. Magnor’s brother, Issjelgard, led away a raiding party leaving the castle only lightly defended. Hedin led the main body forward in two waves toward the castle. To the east the lightly armed and armored hird led a feint with ladders against the open wall. To the south, against the main gate, Hedin himself led his best troops forward with a powerful bear’s head ram and more ladders. Sven kept his personal retinue of Norwegians together to the west to block the returning Issjelgard. Issjelgard never had a chance. His men, laden with stores taken from the countryside were first astonished and then crushed by the battle-ready Norwegians. So much so that as Issjelgard fell and his men ran toward the safety of their longships, Sven led a contingent over the wall, actually getting onto the parapets before Hedin. Hedin’s archers made it difficult if not impossible for Magnor’s defenders to expose themselves over the merlins and the ram smashed through in only ten minutes of concentrated work. A few rocks dropped desperately from the top of the gatehouse caused the only casualties amongst the rammers. Valiantly portraying the forlorn leader on his way to Valhalla, Bloodax slew four attackers on the parapet before finally succumbing himself. Sven proved again his extreme prowess in battle, crushing three defenders as he led the assault over the crenels, before the defenders cried for quarter. Played using 25mm figures and OxNard Siege Rules by the Long Island Irregulars on 3 November 2017.